Choose from a variety of flagpoles to mount your new flag. We have flagpoles for use indoors as well as outdoors, made from sturdy Aluminum, Galvalume® and Fiberglass ranging in size from 20 to 40 feet. New Century Flags also carries accessories such as finial tops, stands, pulleys, clips and brackets.Check out our dedicated flagpole website, www.tillonca.com. Call us today for a quote on larger Commercial Flagpoles! We offer finial tops, flagpoles, stands, pulleys, clips and brackets. 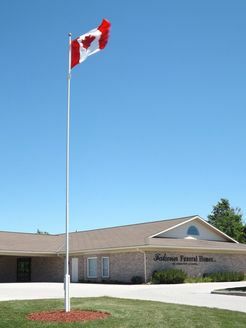 We offer Aluminum, Galvalume® and Fiberglass flagpoles in sizes from 20 to 40 feet. Prices: 18.5’ Flagpoles Kits $159.95 and 22’ Flagpoles Kits are $219.95. These are 18.5' & 22' Complete boxed Kits- Great for transporting in almost any car, van etc. Although these flagpoles are made of steel, they are coated with a special Galvalume coating and then powder coated shiny white. They are sold in a boxed kit and have 3 sections that swaged together. They come with everything you need to get started; a ground sleeve, rope, pulley, nylon clips, rope cleat & J-bolt for the pulley to rest on.